When I started out with birds I knew absolutely nothing. Bird Talk is responsible for all my basic knowledge of birds. They always seemed to come out with an article relating to what was happening in my bird life. When I started breeding budgies they came out with an article on that. When my pet cockatiel flew away they came out with an article on catching/preventing lost birds. The only problem is that it tends to be basic and sometimes very repetative. Bird Talk is perfect for pet owners and beginners but has little to offer advanced aviculturists and breeders. Here are two books that belong in every breeder's library. The first is by Rick Jordon and tells you just about everything you need to know about eggs and how to hatch them. Chapters include: The Egg (the physiology of the egg itself and how it is formed), Aviculture as a Prelude to Incubation (Basic Breeding info), Preparing for Incubation (getting your equipment and records ready), Candling and Repairing Eggs (how to spot abnormalities through candling, how to fix shell problems), Incubating Eggs (temperature, humidity, ventilation, turning, etc. ), Egg Weight Management (weight loss in eggs), Hatching and Hatching Assistance (pipping, problems that arrise during hatching), Using Chickens as Natural Incubators (why you may want to use chickens, how to use them), Learning from your Mistakes (finding out what what killed a chick and how to prevent it from happening again). It also contains several appendixes with charts on things such as desired weight loss and incubation periods. The second book is by both Howard Voren and Rick Jordon and tells you everything you need to know about rearing chicks after they hatch. Chapters include: Managing the Nursery (proper set-up and function), Maintenance of Nestlings (temperature, light, humidity, bedding, etc. ), Formulas (recipes, sterilization, storage, heating, digestion, supplements), Feeding Instructions and Methods (feeding utensils), Feeding (quantity, temperature, feeding response, frequency, how to feed), Weight Monitoring (daily weight gains and losses), Non-Dietary Factors that Control Weight Gain (things that may cause your bird to loose too much weight), Potential Health Problems in the Nursery (Murphy's Law and all the different ways you'll see it, largest chapter), Non-Pathogenic Death (what are you doing wrong? ), Medical Procedures for the Aviculturist (basic medical techniques you can use to aid chicks), Weaning (how to wean, when does it occur, potential problems, imprinting, weight loss). Both books make handy reference guides and contain information that can be used for almost every species. No breeder should be without them. 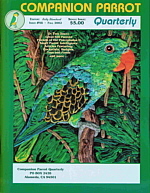 Previously known as The Pet Bird Report, Companion Parrot Quarterly is Sally Blanchard’s magazine. It caters to more educated bird owners and those who view their parrots as members of the family and not mere pets. Sally and staff put the birds first in all their efforts. Unlike every other magazine I know of, they actually screen their advertisers- breeders must provide references and conform to certain standards and toys are checked for safety hazards. Articles are also closely edited to make sure no bad or potentially harmful information slips through. The bulk of its articles are on behavior or personal experience. Unfortunately, at this time CPQ is really a parrot magazine. Articles on the smaller species are few and far between but I think this is due to the editors/writers specializing in the larger species alone. The most commonly discussed species seem to be cockatoos, greys and amazons. Smaller bird owners can certainly learn a lot from this magazine and I applaud its "no less than the best for our birds" attitude, but such owners may still feel a bit slighted at the lack of information on their birds.